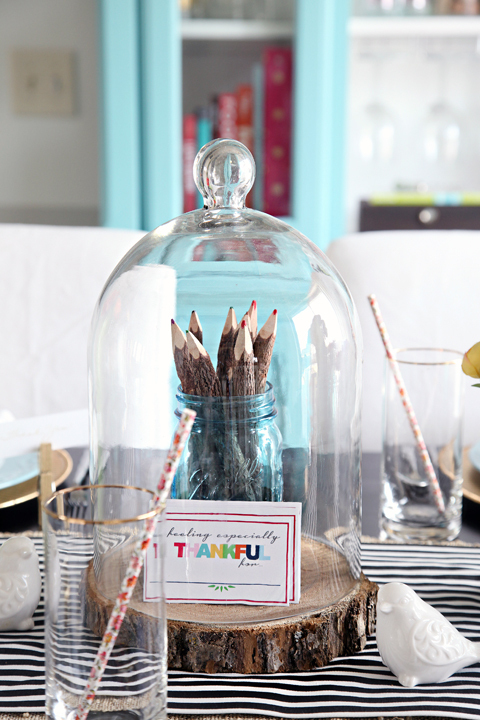 IHeart Organizing: Our Thanksgiving Table & a Printable! 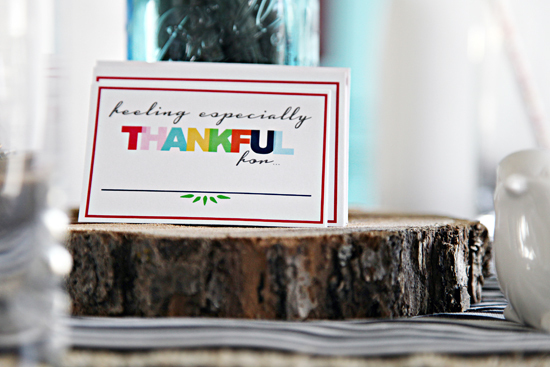 45 Our Thanksgiving Table & a Printable! Helloooo friends! I love this time of year as I feel I have endless reasons to be grateful and thankful. Not to mention, we are about to fill our home with family, and that is what it is all about. Home. Family. Fun. I have been wanting to create a special table this year, to really celebrate coming together. My grandmother, who is in her 90's, is coming! She is pretty much one of my most favorite people in the whole world, so having her at my table this year means more to me than words can express. This table is for the adults. I will be setting up a separate table for the kiddos nearby, which I am looking forward to doing maybe even more since it is less fussy and typically filled with activities and crayons. Not that this table is really that fussy. 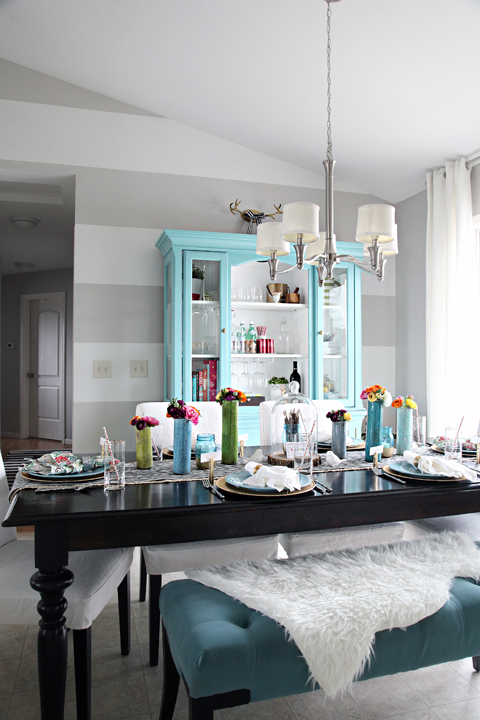 As many of you know, I don't always stick with uber traditional anything, and love to inject my spaces with color. 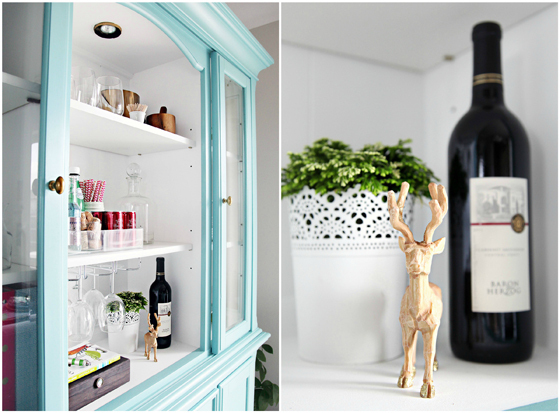 My favorite part of the whole process was playing off of our newly painted hutch. Gold and teal was going to be the theme on the table as well. 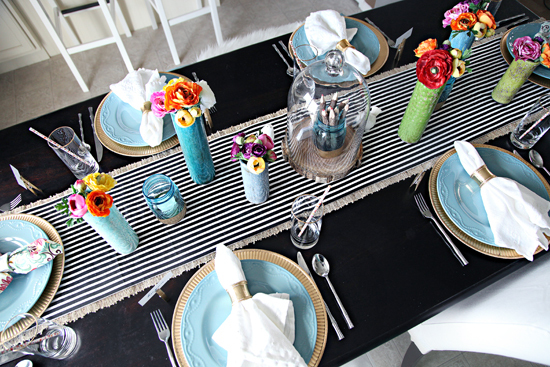 Everything used to create the table setting, were items we already had floating around, paired with a few quick DIY projects. First up, the runner. I already had the natural runner, but wanted to create layers and inject a little black to ground things. I took some already owned fabric and because I don't sew, I "no sewed" the runner with some hem tape. 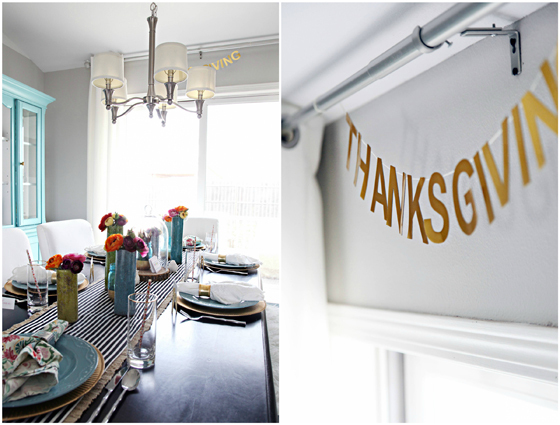 Using my Silhouette, I cut some letters out of chipboard and gold foil, and attached the two to give myself a sturdy Thanksgiving banner. 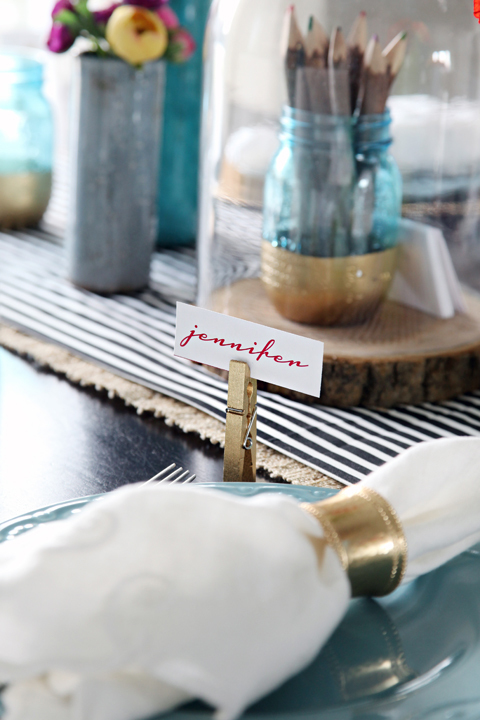 For the place card holders, I went straight to the laundry room and scooped up a handful of clothespins. Which of course received a gorgeous coat of gold spray paint. And as an added bonus for when we gaze at the place cards across the way, I embellished the backs with a "Thank You" stamp. My father-in-law is the best. He helps us with so many things and one day he overheard Bryan and I chatting about heading out to the woods to find a dead tree to chop up to create some chargers. A few days later, he showed up at our door with a stack in hand. He really has a heart of gold. ...along with some Thankful cards I created. Nearby, we hung up some artwork to correlate with the nearby table. 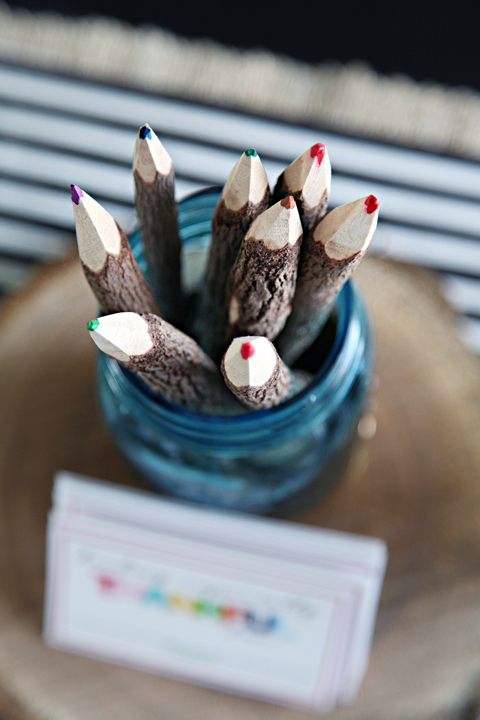 You must check out Nest of Posies blog for some amazing free printables! And that my friends, is our happy little Thanksgiving table. 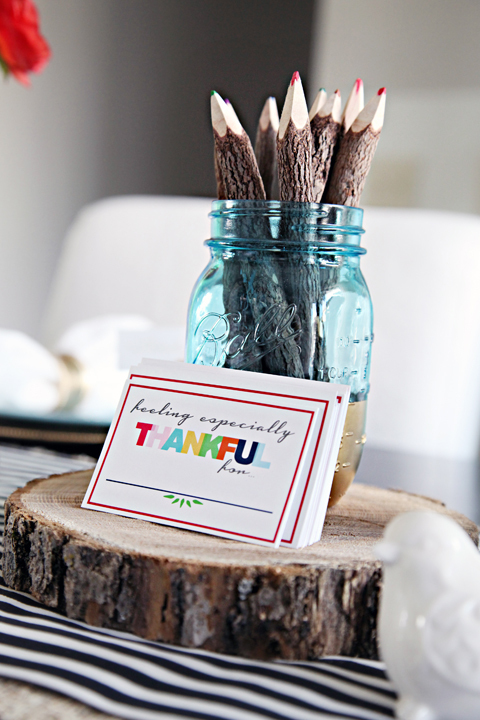 And here is the "Thankful For" freebie, because I am also very thankful for YOU! The kiddos will be home from school for the next couple of days, and our home will begin filling up with our guests, so I am going to take the rest of the week to relax and cherish this heart filled home we work so hard on. I will be stopping in on Thursday to give a special thank you shout out to those that sponsor all we do, as well as share a few Black Friday deals, so stay tuned for that goodness. Cheers to a happy and safe Thanksgiving to all of you! I hope that it is full of love, laughter, traditions, family and good eats... and that you get to take a little time off from work, house projects and even organizing, to enjoy what truly matters. Your table is beautiful! Enjoy celebrating with all of your loved ones (especially your grandma). Also, so sweet about your FIL. 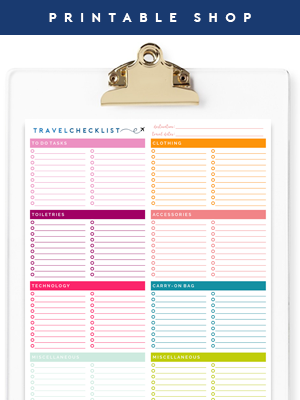 Thanks for these great little printables! Have a wonderful Thanksgiving. 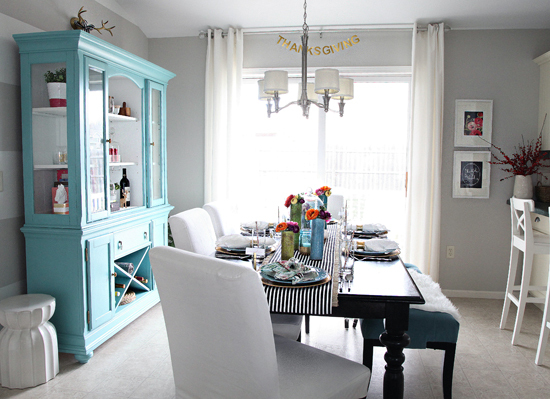 Beautiful table...I am so jealous of that hutch, have been looking for one to spruce up! Hard to find the right one! 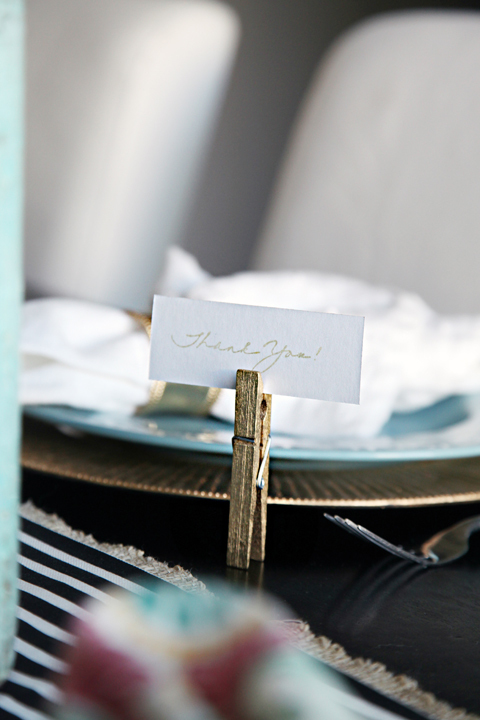 Your table setting looks Beautiful! Have a lovely Thanksgiving! It all looks so so amazing! Have a great holiday! 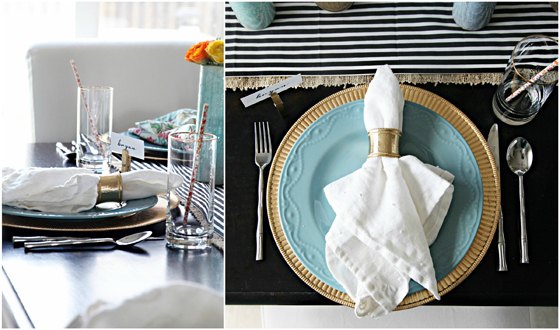 I love this table setting!! I really appreciate that you are including a thankfulness exercise at your family dinner. Cultivating an attitude of gratitude is so important! This is absolutely stunning! My favorite thanksgiving table ever. I love the black and white with happy colors, and the wood charger things are KILLER! Happy Thanksgiving! I love the Thankful cards. This time is so much fun - special but not over done in the whole fall theme. Love the colors! This setting is beautiful- love it! Awesome! The table looks great, love the Thankful Cards. I love your blog. Please tell about the flower vases on the table, very pretty. your table is beautiful! I LOVE all your colors. I am a color girl too. But what got me teary eyed was the thought of your Grandma being with you at your beautiful table. Enjoy it & soak her up. My BEST & FAVORITE memories are of my Grandma on Thanksgiving & Christmas! 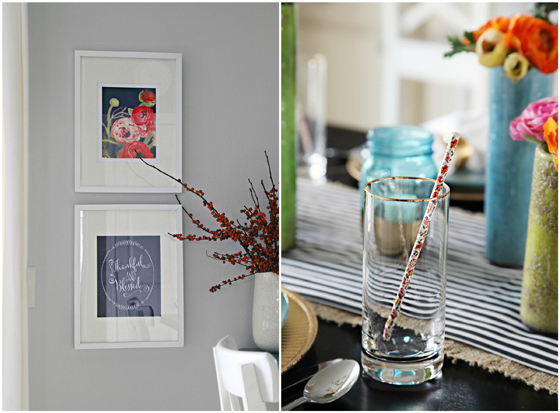 Thank you for including my printable in your lovely home! LOVE the table setting, all the decorations, everything! 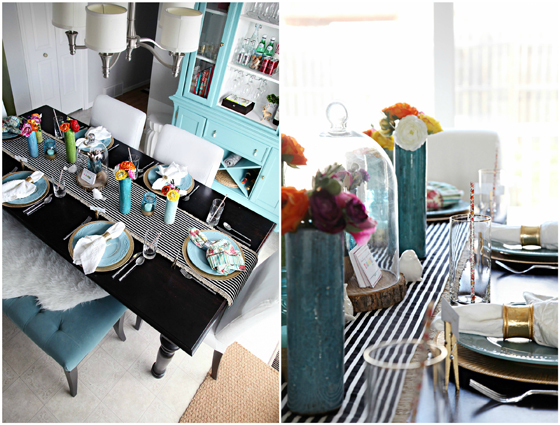 I feel very inspired for the next time we host a family dinner!! Your Thanksgiving table is gorgeous! It looks both warm and inviting. This time of year is really about family and enjoying special time with those that we love! I hope you & your family have a blessed Thanksgiving! It's beautiful, Jen. Happy Thanksgiving to you and your family. I LOVE THAT IDEA! The table setting looks so wonderful! Have a great Thanksgiving! What a beautiful table! 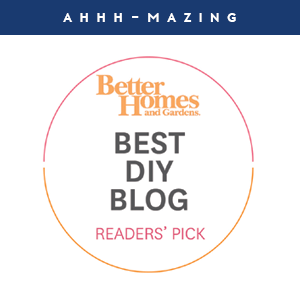 I think the colours you've used are gorgeous and they match that new hutch wonderfully! Thank you for the printable. Great idea! I typically LOVE all of your decor. For some reason this feels a bit too Spring for an autumn tablescape. I know you don't always go with traditional, but some seasonally appropriate touches would add a bit more coziness. Pretty table! And I am thankful for you - your inspiration, your creativity, your willingness to share your home and family, and your sense of style and humor. Thank you! Happy Thanksgiving to you and yours!! Wow, that is a lot of compliments wrapped in a super sized bow. Thank you so much and Happy Thanksgiving! Beautiful! I have logs outside that I have been itching to cut for a table center piece...love how your table turned out! Love the flowers, are they fresh or paper?? Hi Carmen! For this little run-through, I used some artificial flowers I had on hand. They will be replaced will real blooms for the actual Thanksgiving dinner. I just didn't want to have to purchase them twice or worry about them not making it through to the actual day. I am thankful that I found your beautiful blog Jen! Every time I look at my organized (not so much right now) pantry, I think of you! Thank you so very much for your cards here. Beautiful table setting. Very nice. I love the use of blues instead of traditional colors. Love it! As a doctor and mom of 3 young kids (4, 2 and 8 weeks), I live by your blog! 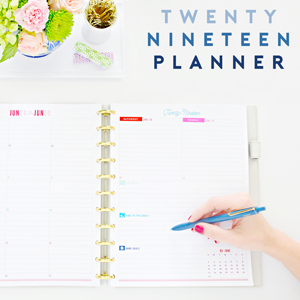 I feel like if I can just get your organizational systems in place, life will be less chaotic. 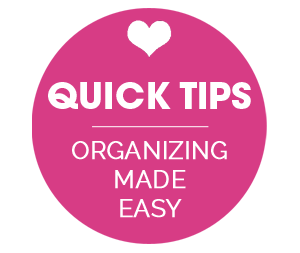 Would you consider writing a post about dealing with the clutter of large family visits over the holidays? For Christmas, everyone comes to visit us in Hawaii - my husband has 3 older sisters, which means 9 adults, 10 kids (8 weeks - 10 years old). Any tips to keep the dishes/laundry from getting overwhelming and trying to keep the kids responsible for their own messes? 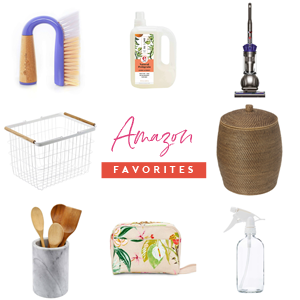 The holidays are so wonderful, but we just don't want to spend the whole time cleaning up! It is so so beautiful! 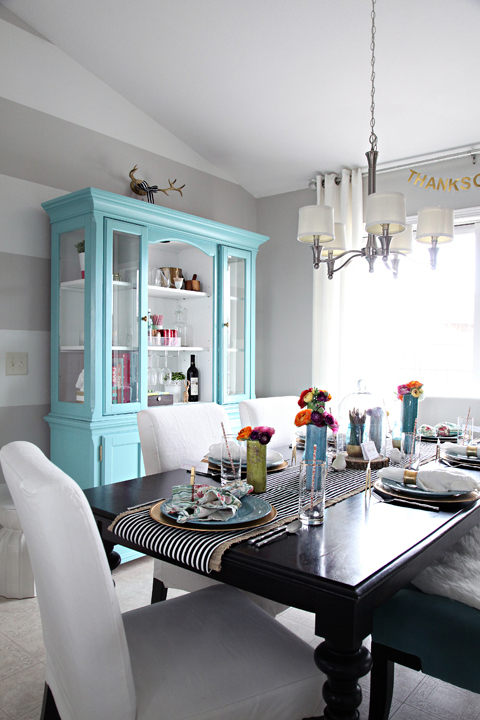 Love this cheerful, colourful take on Thanksgiving! I got lucky! He knew we were hoping to use the slices as tabletop decor, so they fit under plates and luckily the cloche. My FIL rocks! Love it! I love everything about it! Could you tell me where you found your natural table runner at?